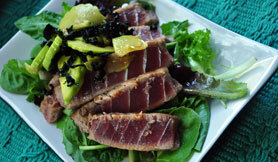 The one thing I love about eating and preparing raw food meals is the pure simplicity. In truth, it’s really the use of only all-natural, whole-food ingredients that are used. Other than that I guess the prep work is a bit non-simplistic. Raw food prep takes some time but the end result is way worth it. As these aren’t the most beautiful thing I’ve ever created, they were darn tasty, and more than worth the little bit of extra time it took to blend, chop, and roll into “sushi”. These rolls were fresh, super flavorful, and incredibly filling, despite the size of them. I made these so long ago and completely forgot to post the recipe that I almost need to make them again to get the flavors stuck back in my head. I loved them. And these got raved reviews by my parents and sister. I made these quite a while ago, in fact, that there is quinoa in the nut base. Nope, not Paleo, but, like with all recipes, make them your own. Start with the base nut pate (base, with or without the quinoa) and add in whatever seasonings, other flavors, and veggies you want. 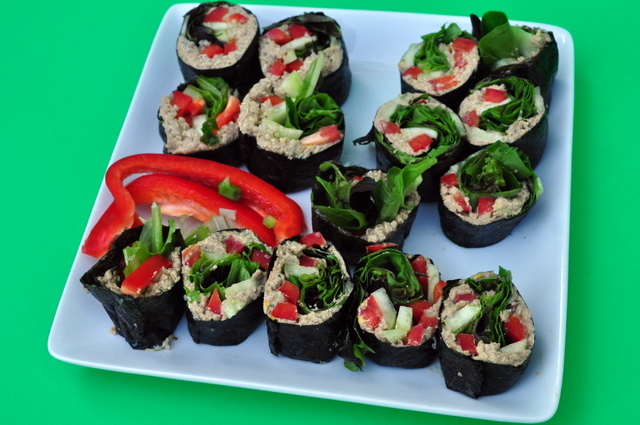 Think Asian, Mexican, Thai, Ethiopian, Japanese, Chinese… whatever type of roll you want, you have the power to create. Makes a lot. Gluten-free, dairy-free, high protein. in a food processor. Process in pulses until the nuts are mostly broken down and a paste starts to form. Add in the parsley and green onion. Pulse until just incorporated. Stir in the quinoa, if using- (or remember to add another cup of nuts into the processing above) and mix well. 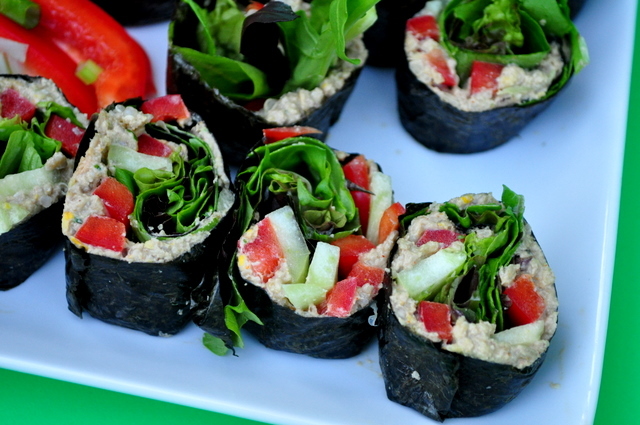 Place a nori sheet, smooth-side down, onto a cutting board and place heaping spoonfuls of your walnut pate on top. 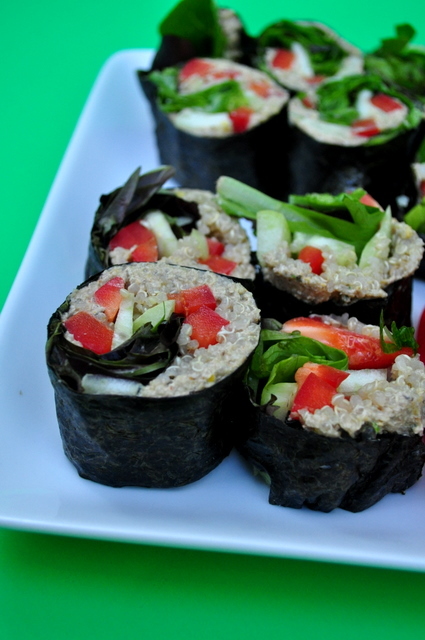 Spread evenly across three-fourths of the nori sheet. If you need more pate, feel free to load up. 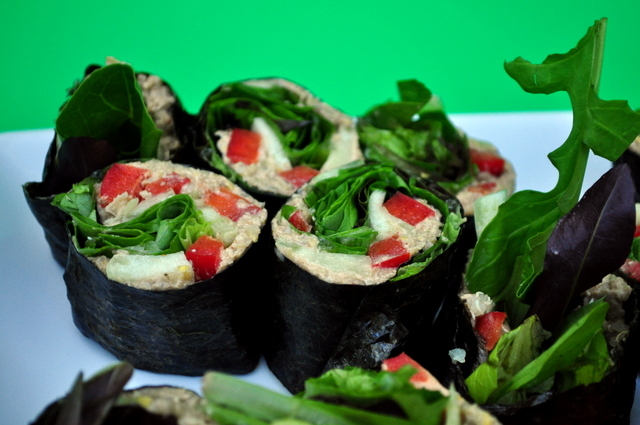 Place thinly sliced veggies on top of the pate and being to roll your nori sheet, leaving the empty side of the sheet for the end (last to be rolled). As you roll, keep the rolls tight or your sushi roll will be lose and fall apart easily when cutting and eating. 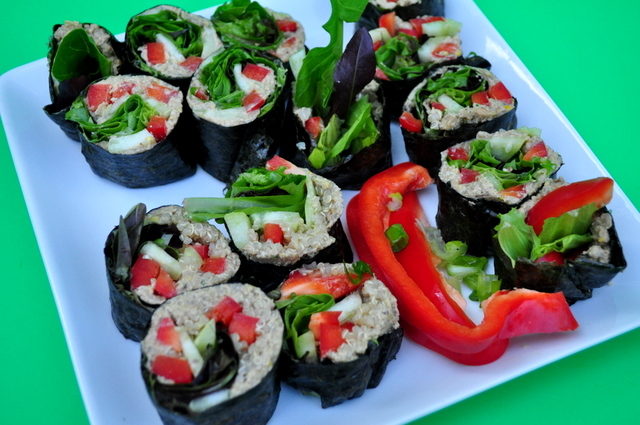 Once you have one roll, continue to create more rolls, until you have the desired number you’d like to eat and share. To cut: Dip a sharp knife into water and slice each roll into 6 even slices. Try not to “saw” the knife, instead use one even stroke. Wala! Eat and enjoy! May serve with a small bowl of Tamari or soy sauce for dipping. These may look like a lot of work, or even like a lot of ingredients, but try them! They’re super easy (just throw everything in a food processor!) and definitely delicious. And go enter the CORE Food giveaway! Giveaway ends on Sunday!!!! sushi yes please! looks delicious Lori! making our own sushi is still on our to make list!! one day we will do it! Great job with the sushi! I take it you used cooked quinoa? As much as I am in LOVE with sushi, I can’t believe I have never made my own. Thanks for the inspiration! Holy missoooo those look so good! Its definitely difficult to make homemade sushi look appetizing, but I think you succeeded.